Our goal at CLIMB Works is to push you outside of your comfort zone in a safe and controlled environment at your own pace, which is exactly what our mountain biking course helps you to do. Because of the mountainous terrain, our 2-mile trail is considered intermediate, which means it can be a little intimidating for those who have never been mountain biking before. However, it is the perfect opportunity for you to push past your fears and do something you’ve always wanted to do. You can complete the trail as fast or as slow as you would like, and since it’s a one-way loop, you don’t have to worry about oncoming traffic. This allows you to step out of your comfort zone while still finding it easy to relax. 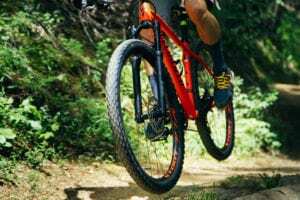 We also have a new trail in 2019 that is a 2-mile stacked loop trail with an intermediate climbing section that leads to a fast, fun downhill ride. This trail cuts through dense pines and crosses several wooden bridges. We want everyone, no matter their experience level, to feel comfortable on our bikes and trail. That’s why we always have one of our expert staff take you on a guided tour for your first loop. This is great for beginners to learn the basics of biking and how to handle the terrain and for more advanced riders to learn new techniques and tricks. Our experts give you all the pointers you need in order to have a safe and fantastic time mountain biking. They play a big role in helping you have a great experience. If you’ve never been mountain biking before, chances are pretty high that you don’t have your own bike. Luckily, you don’t have to own your own bike to have fun at CLIMB Works! We offer high-end Specialized, pedal assist mountain e-bikes that provide increased stability and control. These bikes allow you to take your own strength and ability to the next level. The great thing about renting one of our bikes is that all of our rentals are inspected before and after being ridden, so you are guaranteed a bike that’s in great condition. The best part about mountain biking at CLIMB Works is that you get to ride our flagship feature, The Curliest! The Curliest is a wooden, roller-coaster-esque structure that is the pride and joy of our originaltrail. 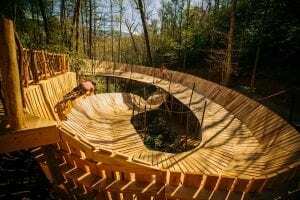 It is tucked in the heart of the Smokies, built over a stream and is pleasing to both the eyes and the wheels! The Curliest is fun for both beginners and experts. If you feel comfortable riding a bike on a sidewalk, then you will feel comfortable riding on The Curliest. As a special bonus, you get to ride this part of the trail as many times as you’d like! At CLIMB Works, our goal is to get people out of their comfort zones. That’s why we like to combine both adventure and nature in our activities. Adventure brings out the excitement and fear, while nature relaxes and calms you. We don’t push you to the extreme, just beyond the comfortable. As long as you feel comfortable riding a bike, have decent coordination, and are ready to sweat, then you have what it takes to mountain e-bike with us. What are you waiting for? Come mountain biking in Gatlinburg for the first time with us at CLIMB Works! Learn more mountain biking, then start planning your adventure.